as performed at the Haymarket Theatre in 1854. In 1854, Goldilocks, that fickle food taster, chair sitter, bed sleeper, and precocious felon of the breaking and entering ilk, brought her act to London's Haymarket Theatre for a special Easter performance. But you would not have recognized her. She had silver hair. Who knew that the story of the girl with the golden tresses who home invades and chow-down fresses had been adapted to the stage? And what was a fairy queen doing in the production? In this dramatization of the classic childrens story, the heroine is called Silverhair, she runs away from her mother to escape a wooing squire, and winds up at the house of the three bears, who are not happy with the picky, picky, picky child for eating their porridge, sitting in their chairs, and sleeping in their bed. Silverhair is rescued from their wrath by the fairy queen. 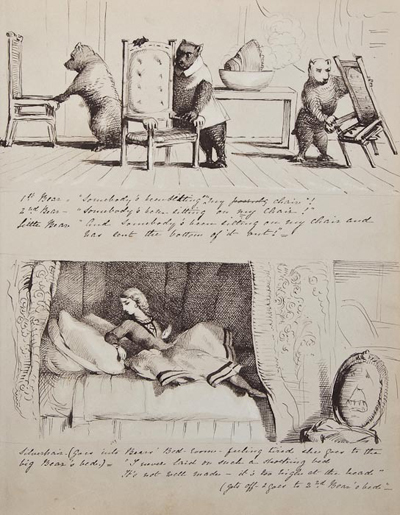 While the story has been around for approximately 200 years, the earliest recorded version is The Story of The Three Bears metrically related, with illustrations placing and dating it to Cecil Lodge in September 1831. One Eleanor Mure had written the story in verse and illustrated it for her nephew from the story she knew through oral tradition. In Mure's version it is an old woman who intrudes into the bears' home, sampling their food, etc. (Opie, Iona and Peter. The Classic Fairy Tales. New York: Oxford University Press, 1974, pp. 199-200). In 1837, Robert Southey published the story in volume four of his seven volume collection of essays, The Doctor &C (London: Longman, Rees, Orme, Green, and Longman, 1834-38), under the title The Story of the Three Bears. Here, too, the intruder was an old woman. Another early version is known as Scrapfoot, and a fox is the moocher in the bear's house. In 1850, however, the fox and old woman were jettisoned when the story was published in the anthology, A Treasury of Pleasure Books for Young Children (London: Grant and Griffith, & Joseph Cundall). The protagonist was now a young girl named Silver Hair, and it is in this iteration that the story was adapted for the Haymarket Theatre's 1854 Easter production. In 1855 she became Silver-Locks in Aunt Mavor's Nursery Tales (London: George Routledge & Co.). In 1868, she became Golden Hair in Aunt Friendly's Nursery Book (London: Frederick Warne), and somewhere a scholar is probably investigating whether the blonds have more fun trope is somehow connected to Golden Hair; only her hairdresser knows for sure. In 1904's The Old Nursery Stories and Rhymes (London: Blackie & Son), Goldilocks made her debut. The old woman was too hot. The fox was too cold. Silver Hair was too soft. Golden Hair was too hard. Goldilocks was just right. The name stuck. COOPER, [T. George]. The Story of the Three Bears, of Little Silver Hair and the Fairies, as performed at the Haymarket Theatre as an Easter piece in 1854. Quarto. Twenty ink drawings by T. George Cooper with quotations from the script and the musical score. Two drawings full-page, the remainder two to a page, drawn directly into a contemporary, gilt morocco Victorian album. Image courtesy of Bloomsbury Auctions, offering this item as lot 462 in its Books, Manuscripts, Maps, and Works on Paper sale, December 15, 2011, with our thanks. It is estimated to sell for £400-£600 ($627-$940).